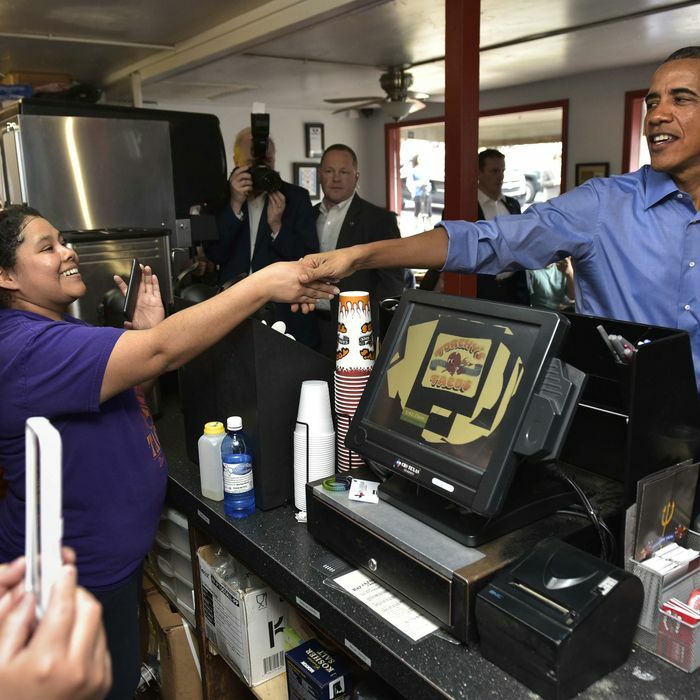 Earlier today, during his visit to Austin, Texas, where he is speaking at South by Southwest, President Obama dropped by local taco chain Torchy’s for a bite. The food-obsessed president, who may or may not be angling to get a job as a restaurant critic after his term is up, reportedly started cracking dad jokes as soon as he entered the restaurant, telling workers they were violating health code because of all the reporters holed up behind the counter. Apparently, though, he didn’t get the message that breakfast tacos are super popular in Austin — or maybe he has some friends in San Antonio — though he did manage to get his fill of jalapeño sausage, beef barbacoa, and refried black beans.